With heavy hearts, we share with you the passing of Donna Lynn VanDolah on October 27, 2018, in Hastings, NE. She was 65 years old. Donna was born September 19, 1953, to Alfred and Betty DeFruiter in Gothenburg, NE. Donna was one of eight girls. She spent her childhood making lifelong memories with sisters she loved very much. 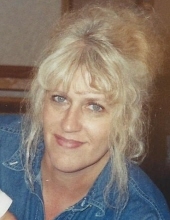 Although she attended school in Gothenburg and later attended college in Hastings, NE, Donna loved adventure and lived in many places throughout her life and tried many new things. She loved music, especially the oldies, and her children cherish memories of dancing in the kitchen with their mom. On March 4, 1998, she married Frank VanDolah in Hastings, NE. In the final years of her life, she spent many hours quietly reading her bible and devotionals and praying for her children and grandchildren. She carried all of her children in her heart always. Donna was preceded in death by her parents; previous husband, Robert Tinlin; and daughter, Danielle Engberg. She is survived by her husband, Frank VanDolah; son, Daniel (Cara) Dyke; daughters, Tracy (Robert) Summers and children, Josie, Eli, and Andy; Betty (Jason) Vertin and children, Lexi, Max, Chance, Rowen, Charlie and Mary; Scarlett (Aaron) Johnson and children, Addison and Aarison; Angel (Nicholas) Lakin and children, Isaac, Nicole, McKenzie, and Adelynn; Bobbie Mckelvey and daughter, Airionna; and Samantha Klatt and children, Colton and Colbi; and sisters and their families, Linda Duis, Cheryl Knoedler, Roxie Ritz; Sandy Smallfoot, Karen Derra, Lana DeFruiter and Shanna Kieser. Memorial Service is 2:00 PM, Friday, November 2, 2018 at First Christian Church in Hastings, NE. No viewing or visitation. DeWitt Funeral Home is handling arrangments. To send flowers or a remembrance gift to the family of Donna Lynn VanDolah, please visit our Tribute Store. "Email Address" would like to share the life celebration of Donna Lynn VanDolah. Click on the "link" to go to share a favorite memory or leave a condolence message for the family.